If you were to ask me what kitchen utensil I couldn’t live without—I’d say the pressure cooker. Dinner on the table takes one-third of the time as with regular stove-top cooking. 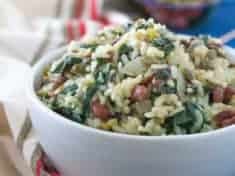 More vitamins remain in pressure cooked vegetables, and then there’s creamy Italian risotto lickety-split! Have you heard the stories about pressure cookers exploding their contents all over the kitchen ceiling? My family has a blown-lid tale to tell as well. That didn’t stop my mother from cooking corned beef and cabbage in a pressure cooker every St. Patrick’s Day, or teaching me the merits of steaming artichokes in 2/3 less time. Beans such as pintos, chickpeas, black beans, white beans and beets cook in record time in a pressure cooker, especially at our 7000 feet above sea level. Lorna Sass, author of several cookbooks about pressure cookery, is my pressure cookery mentor. I learned a lot from her Great Vegetarian Cooking Under Pressure, my pressure cooker bible. I own 3 pressure cookers–my newest is an Instant Pot. The first pressure cooker I bought is an Italian-made jiggle-top. My newer Swiss model, by Kuhn-Rikon, is second generation, with backup mechanisms to prevent buildup of excess pressure. Risotto is made with a short and fat-grained white rice, Arborio. It’s the starch of this rice that gives risotto the creamy texture. Do not rinse the rice or the starch will be lost. ** If you don’t own a pressure cooker, you’ll need more veggie broth, for a total of 5 1/2 to 6 cups. Ladle in the stock, 1/2 cup at a time, stirring all the while (about 40 minutes,) until the rice is creamy and tender. Make it a fabulous week–get in the kitchen and cook risotto! 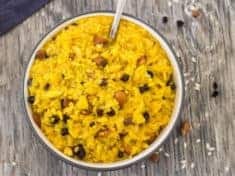 Risotto--easy and quick in a pressure cooker or Instant Pot. In a pressure cooker, heat the olive oil over medium flame. Add the onions and garlic. Cook and stir until the onion is soft. Add the rice, stirring to coat with the oil, cooking for a minute or so. Pour in the wine and cook and stir until the wine is almost all absorbed. Add 3 cups of the vegetable broth. Lower the heat, making sure to maintain the high pressure, and cook for 4 minutes. Reduce the pressure by the carrying the cooker to the sink and running cold water over the lid. Stir in the spinach and continue to cook over medium heat, uncovered, stirring constantly, about three minutes. 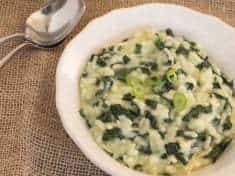 The spinach should be well wilted and the rice tender to your bite, but with chewy texture. Add more broth, stirring, if the rice seems to need a bit more cooking. Stir in the lemon juice. Crumble the goat cheese and stir that in. Season with more pepper and salt if needed. 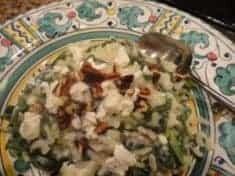 Form cold leftovers into rice cakes and cook in a skillet with plenty of olive oil.